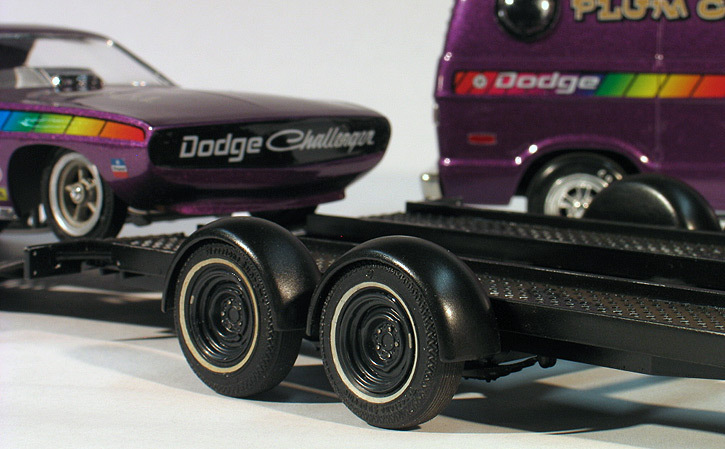 After building the Challenger funny car model for the packaging of the Model King re-issue of the old MPC kit, I thought it would be fun to build a tow rig to go with it. 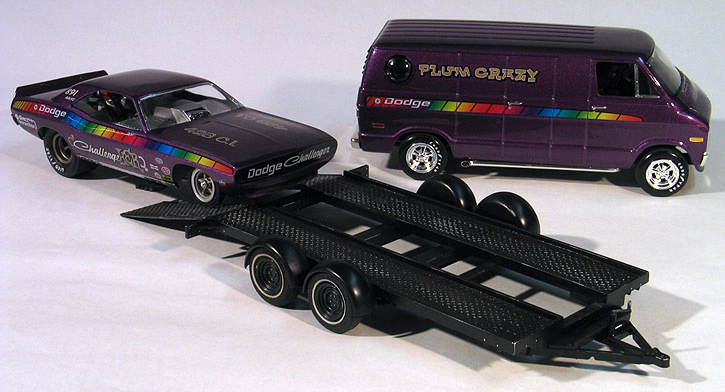 My concept for this tow rig was to build a Dodge van done in a '70's "van craze" theme that matched the Challenger. 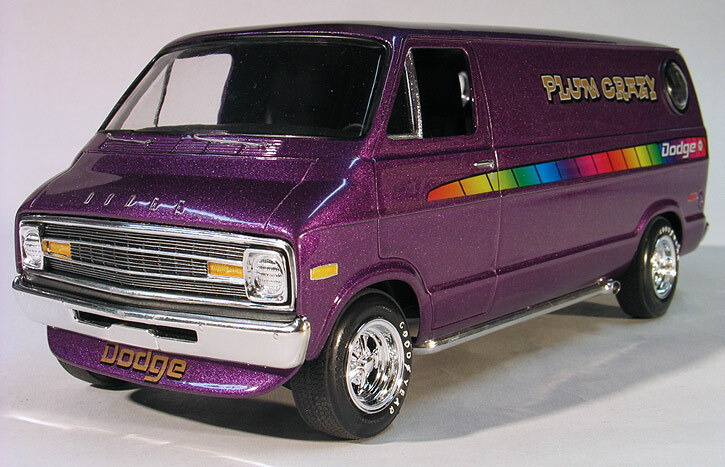 First, I needed a Dodge van kit. 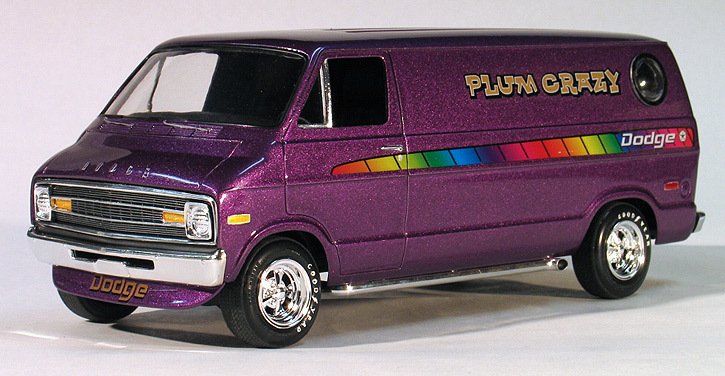 MPC had made several various custom Dodge Tradesman van kits during the '70's and '80's but none have been available for years. I scoured Ebay for several months hoping to find an early unbuilt kit at a reasonable price. 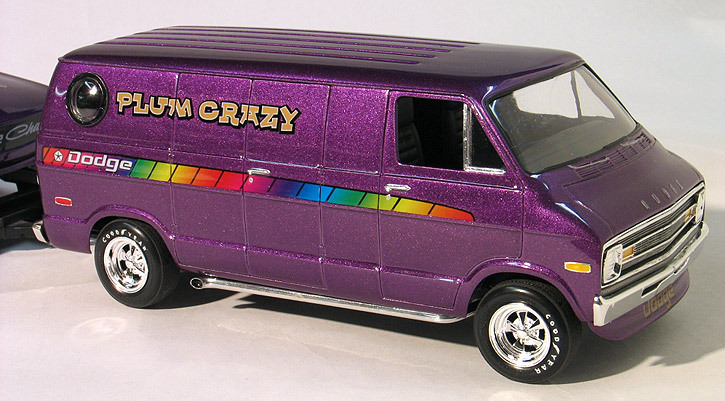 My first choice was the earliest edition which was the '71-'72 window van. The unbuilt ones I could find sold for way more then I wanted to pay. 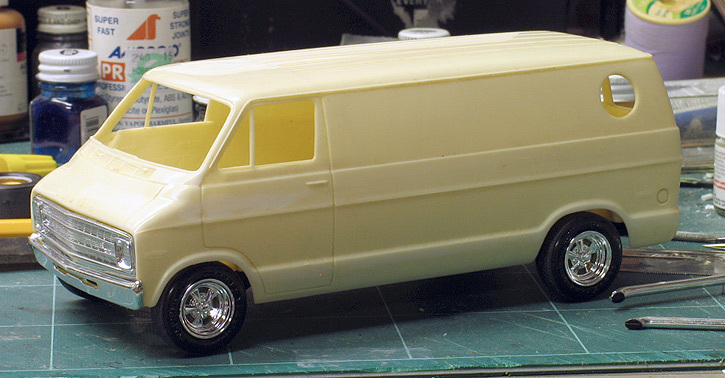 Finally, I found a decent complete and unbuilt '74 Tradesman panel van going for a reasonable price. I bid and won it. 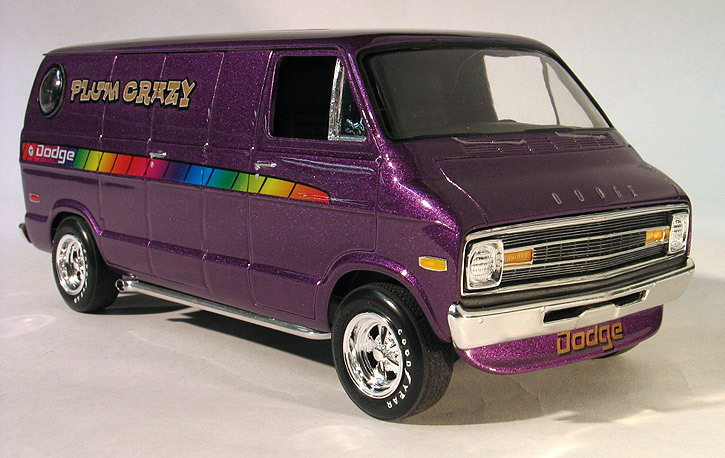 It's the "Truckin' USA" version, for those of you Dodge van kit afficienados. An interesting side note. 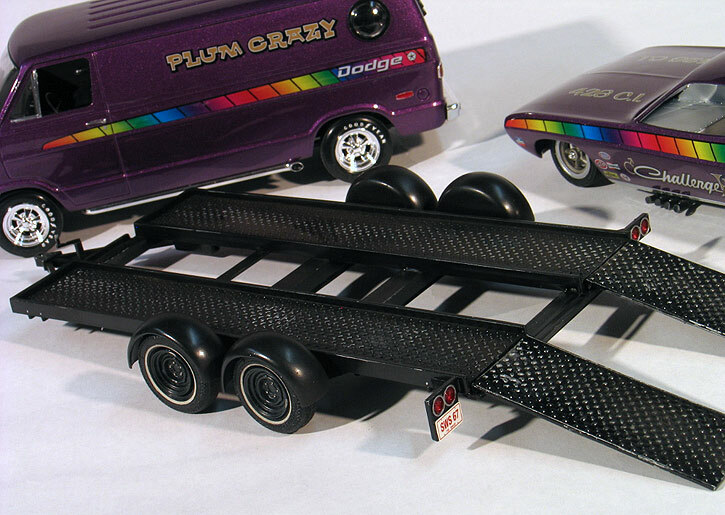 Later on, MPC butchered the tooling of the front of this truck into the inaccurate '80's "Rescue 911" version, making the original '70's versions impossible to re-issue. Too bad as these are pretty decent kits. 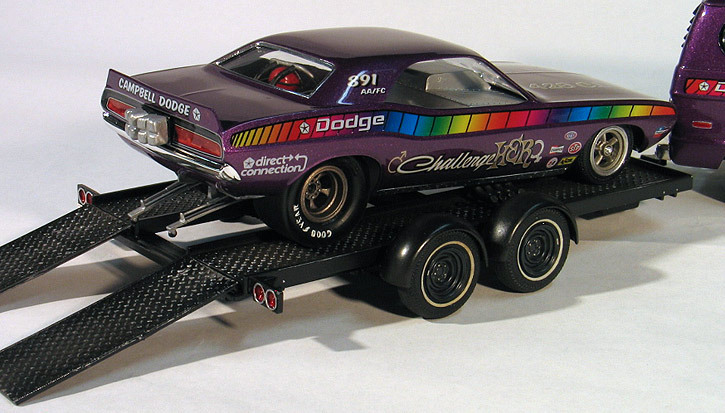 For my tow rig I wanted to match the paint scheme of the Challenger funny car. I painted the body using Testor's Plum Crazy spray paint. 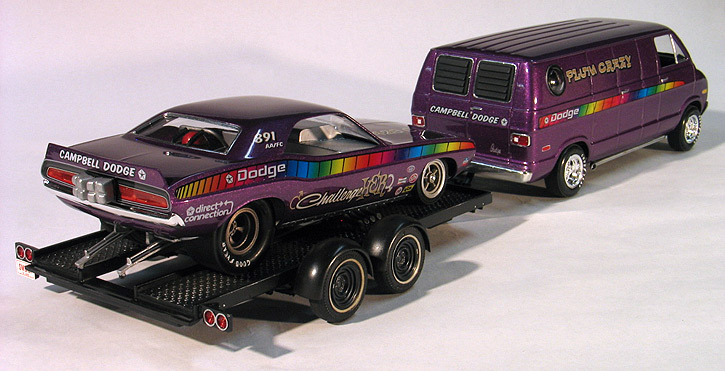 Then, using the decal sheets I designed for the Model King Challenger funny car kit, I carefully cut apart the rainbow side stripes and trimmed them to fit the body contours of the Dodge van. The other decals also came from Challenger kit. After applying the decals, the whole body was shot with Dupont urethane clear sprayed through a small touch up gun. Since I was wanted to give my van an authentic '70's look, I dug through my parts box and found some old custom parts from a few of the old van kits I'd built back when I was a kid. These parts must have been rattling around in my parts box for 30 years. Luckily, I never throw anything away. So, I was able to rescue the long side pipes, front spoiler and rear window louvers from my stash and adapt them for here. I couldn't even begin to tell you what kits the parts came from originally. The Dodge van kit came with a decent set of deep dish 5 slotted wheels but I wanted to use something a little different. I looked through a bunch of kits and finally settled on the Cragar S/S wheels found in the MPC LA Dart kit. I pulled the tires from my parts box. Next, I needed a trailer. I had several unbuilt trailer kits and after some consideration I decided to build this one which is the classic AMT service trailer. This particular one came from the Model King Cougar funny car / Bronco combo kit but, it can be found in several other kits as well. For my trailer I decided to give it a well used generic look so that I could use it with other built cars I have as well as the "ChallengeHer" team. Besides after studying many photographs of '60's and '70's drag racing teams it looked as though the trailer was often just viewed as a workhorse and were pretty plain. It's painted with a simple semi-gloss paint job and has some weathering to make it look used but not overly so. I swapped out the kit supplied tires with some old original '60's AMT white walled tires. These just happened to already be yellowed and slightly dirty from 40 years of laying around so I they needed no additional weathering. I also swapped out the kit wheels for a set of my own resin cast wheels made from a mold of a Johan '68 Chrysler steel wheel. 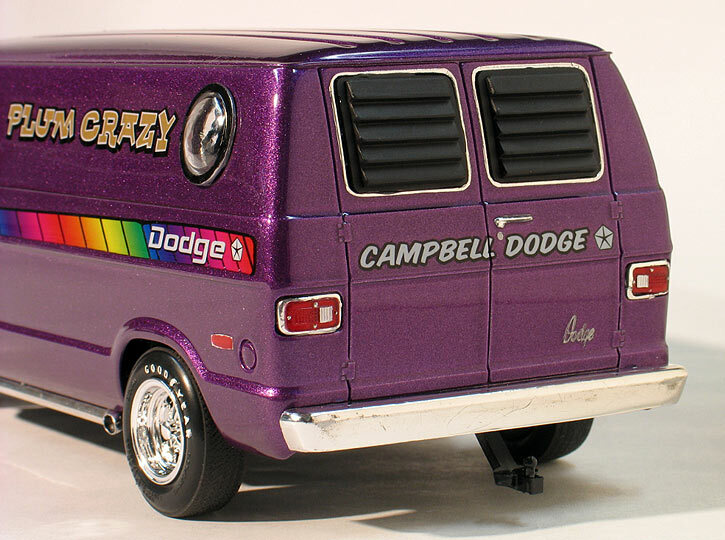 The rest of this custom Dodge Tradesman van was built pretty much out of the box. It was a pretty simple build but, added something unique to my collection.